The basic idea of the forum is rather interesting… all participants come from the Federal District of the Northern Caucasus (Stavropolskij Kraj, Karachaj-Cherkessia, Kabardino-Balkaria, North Ossetia, Ingushetia, Chechnya, Dagestan) plus, at least in the original project, Abkhazia and South Ossetia. I’m sending this post while listening to the concert that closes the youth forum Mashuk 2010 (in Pjatigorsk, Stavropolskij Kraj) open to participants from Stavropolskij Kraj, Karachaj-Cherkessia, Kabardino-Balkaria, North Ossetia, Ingushetia, Chechnya, Dagestan as well as (at least in theory) Abkhazia and South Ossetia. 2000 participants planned (but the actual figure is somewhat smaller). This year a number of youth forums and youth camps has taken place in the northern Caucasus. They have been different in size and scope. Putin explicitly called for the organizations of this kind of events in the Northern Caucasus. Most of them were supported by the Russian government, by Mr. Khloponin, head of the Federal District of the Northern Caucasus and/or by Federal Agency for Youth affairs headed by Vasilij Jakemenko. In May, the final stage of the “Student’s Spring” has taken place in Nal’chik, capital of Kabardino Balkaria, a festival that involves “creative students” (singers, dancers, actors, etc.) from about 70 Russian regions. 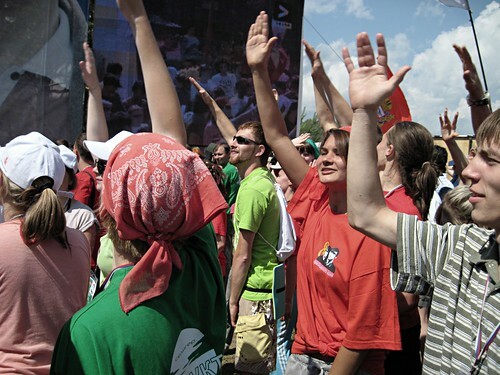 On July 18-23, Nal’chik hosted the youth forum “Kavkaz 2020”, a forum planned for one thousands participants coming from all of the Russian federation (but where North Caucasus republics were disproportionally highly represented) organized by Russia’s dominant party Edinaja Rossija and its youth branch Molodaja Gvardija and largely sponsored by the regional and federal budget. On July 23-31, the Russian Congress of Caucasian Peoples organized a youth forum called “It’s better together” in Dombaj, Karachaj-Cherkessia. Its participants were 200 “young leaders” from the region. 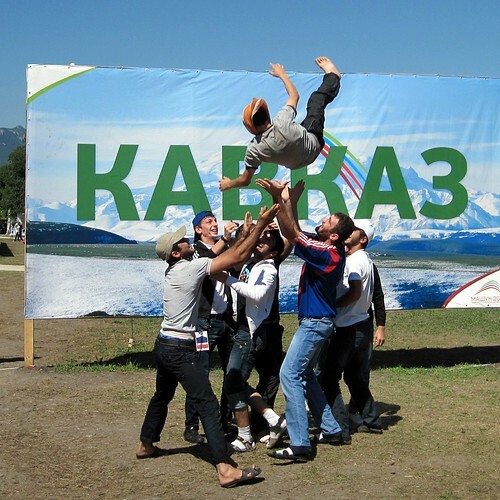 In July, Irex Russia (supported by USAID), organized two forums for young leaders in Kabardino Balkaria…in total, about two hundreds participants between 14 and 24 years old coming from all the territories of the Northern Caucasus. On August 22-28, youth forum “Volga 2010” has been organized in the Volgograd region in collaboration with Edinaja Rossija. It is planned for about 1500 participants… apparently, and funnily enough, participants come from 40 Russian regions, as well as from “Abkhazia, Czech Republic, Italy and Japan”. For September, another youth forum has been organized in the Astrakhan region (Selias 2010), dedicated to young people from the Caspian region, including people from southern Russia/northern Caucasus as well as international guests from Kazakhstan, Turkmenistan, Iran, Azerbaijan. But probably the biggest of them all, and the one more openly supported by the Russian Federal structures, is the youth forum “Mashuk 2010”… planned for 2000 people, it is now drawing to its end in Pjatigorsk, in the territory of Stavropol’ (the forum started on August 8 and will close on August 26). This list might be incomplete. My reportage about the International Youth Forum Seliger 2010 is now online on balcanicaucaso.org (available in Italian here). You can find some pictures there or on my Flickr page. And here's another recent article about youth policies in Russia as a whole and in the Northern Caucasus in particular, that makes reference to Seliger. International youth camp Seliger 2010, July 1 – July 8, Russia. Preliminary notes written on a bus from Seliger to Moscow. Pictures will follow in the next few days. Seliger is the location where in the last couple of years the Russian government, through its Federal agency for youth affairs, has been organizing summer camps for young people from all over Russia. The same location was previously used by the much discussed youth organisation “Nashi”. – first international camp run by the Russian government. Thousands of participants from dozens of countries (89 according to what President Medvedev said speaking at Seliger on July 8). – goal of Seliger in 2010 and previous editions: to bring together young people from all over Russia, offer them a chance to show their ideas and talents, do networking and obtain support for their projects directly from the country’s leadership,without filters or limits imposed by their social or geographical position (social lift), support the current leadership of Russia and the current political course, promote healthy lifestyle (lots of sport activities, ban on alcohol drinking), promote family values (with weddings strongly encouraged to take place during the camp). A success? * most participants said this is an incredible experience,and something they haven’t seen before, for its size and scope. Seliger as a symbol of the current political phase. Focus on economic development and innovation. But calls to build an open society are mixed with patriotic slogans and references to Russia’s current leaders. Chechen, as long as you’re conscious of being a citizen of Russia. delegations coming from Abkhazia and South Ossetia as well.